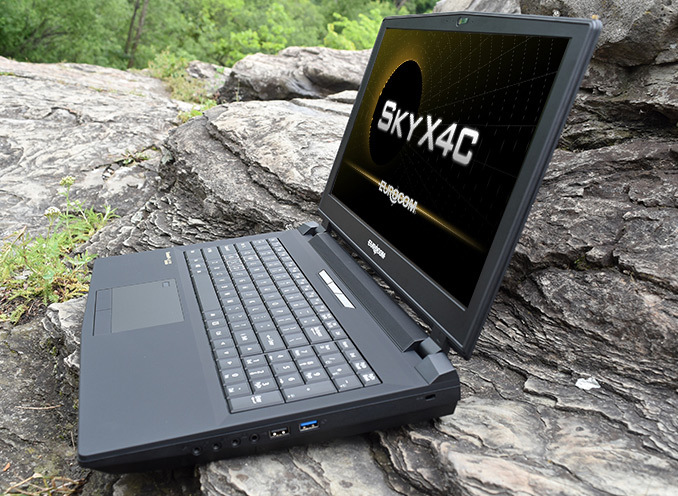 Eurocom has introduced its new Sky X4C, X7C and X9C desktop replacement notebooks featuring Intel’s latest six-core Coffee Lake processors (up to Core i7-8700K) and upgradeable NVIDIA GeForce GTX graphics. Like other Eurocom systems, the machines are manufactured by Clevo, but they will have configurations that are specific to Eurocom. The systems will be available for sale in the coming weeks. Eurocom’s Sky X-series DTR laptops are traditionally based on Intel’s desktop socketed CPUs. Since the Core i7-8700K (Coffee Lake) processors require Intel’s latest Z370 PCH and require new motherboards, Clevo and Eurocom introduced some additional upgrades to the new machines in addition to the CPU and the PCH. For example, all the machines get support for Intel Optane SSDs, a newer Killer E2500 GbE controller, and faster DDR4-3000 memory support. All of the systems can drive four monitors, feature a Realtek ALC892 audio solution with the Sound Blaster X Pro-Gaming 360° enhancements and the ESS Sabre ES9018K2M HiFi Audio DAC for headphones, integrated speakers with a subwoofer, and are equipped with 7-color backlit keyboards with WASD gaming keys. 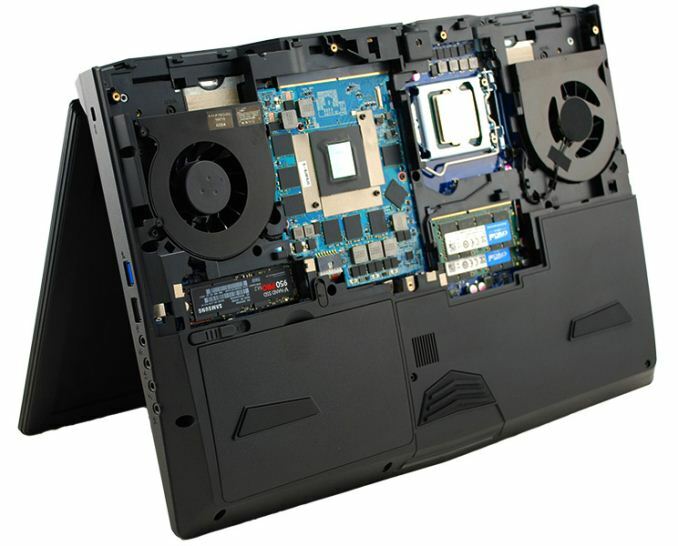 As with all DTR laptops, we are essentially talking about desktops in clamshell form-factors. 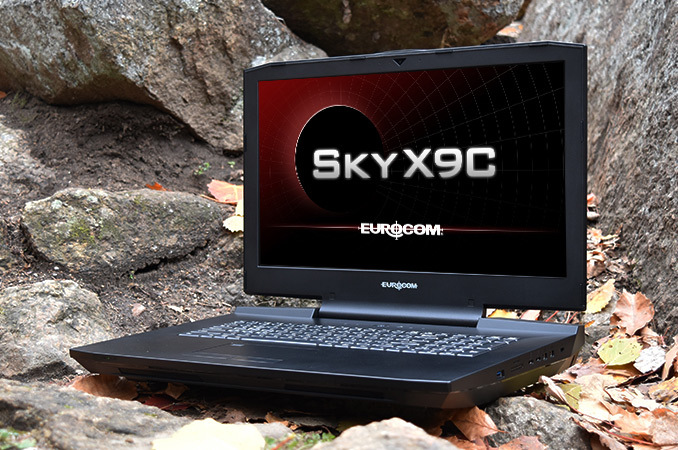 The Eurocom Sky X9C is the most powerful of the systems launched today by the company. It comes with 17.3” display, up to two NVIDIA GeForce GTX 1070/1080 GPUs in MXM 3.0 form-factor, up to 64 GB of DDR4 RAM, up to five storage devices — three M.2 SSDs and two 2.5”/9.5 mm HDDs or SSDs. As for connectivity, the Sky X9C features two Killer E2500 GbE controllers, a 802.11ac Wi-Fi + Bluetooth module, support Killer Double Shot-X3 Pro technology that combines multiple network controllers for extra performance, has two Thunderbolt 3 ports, five USB 3.0 Type-A connectors, and two mDP 1.3 ports. The machine weighs 5.5 kilograms and is 47.2 mm thick, making it rather hard to transport around. 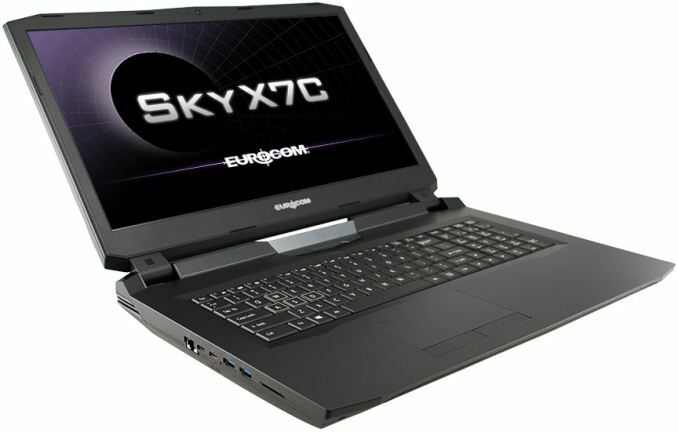 Keep in mind that the high-end versions of the Sky X9C require Eurocom's 780 W external PSU, which weighs 1.7 kilograms on its own. The Sky X7C from Eurocom is another 17.3” machine that is very similar to the X9C, but which supports only one GPU and four storage devices. A good news is that the Sky X9C consumes less power and therefore does not need three blower fans. The machine is also rather heavy — it weighs 3.9 kilograms and has a thickness of 39.9 mm. Furthermore, beefed-up versions of the Sky X7C come with two 330 W PSUs, which are not easy to carry around. 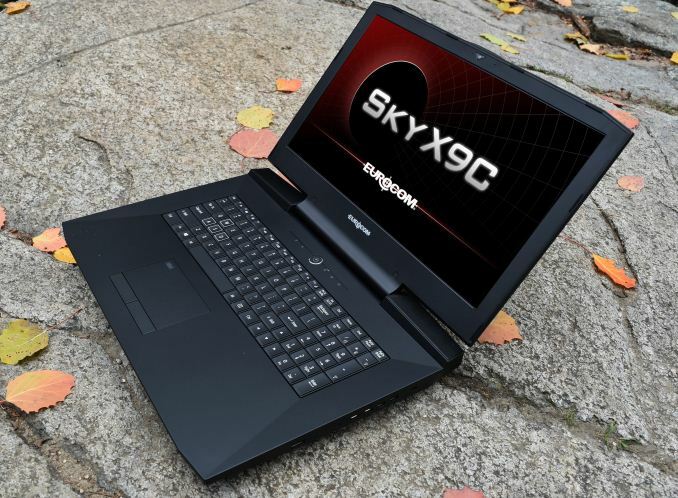 Finally, the Eurocom Sky X4C is a 15.6” laptop that can integrate NVIDIA’s GeForce GTX 1060 or 1070 GPU, two 2.5”/9.5 mm storage drives, two M.2 SSDs, one TB3 port, four USB Type-A connectors and so on. Apart from dimensions, the main difference of the Sky X4C is pre-wired support for 4G/LTE WWAN module so it can be used to access the Internet where other laptops cannot. At 3.4 kilograms, this machine is slightly lighter than its bigger brethren, though it is pretty thick as well at 38 mm. Meanwhile, even overclocked configurations of the Sky X4C do not consume more than 330 W, these DTR notebooks are a little more portable than the even larger models. Dimensions Width 428 mm/17.1" 418 mm/16.72" 386 mm/15.44"
Depth 308 mm/12.3" 295 mm/11.81" 262 mm/10.48"
Thickness 47.2 mm/1.88" 39.9mm/1.6" 38 mm/1.52"
Eurocom plans to start sales of the new Sky X C-series laptops based on Intel’s Coffee Lake processors on November 15, 2017. 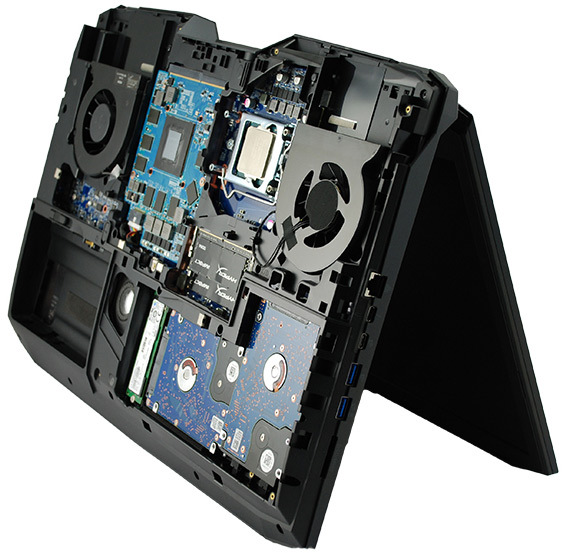 Pricing will vary as Eurocom will offer various configurations of the notebooks, but expect them to be on par with the previous-generation Eurocom Sky X E2-series machines available today. "...introduced some additional upgrades...a newer Killer E2500 GbE controller..."